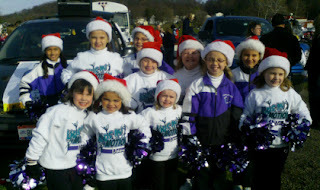 Kids In Motion Winter Pom Pon Unit with DXG Team Dancers let Lancaster know that "Santa Claus is Coming to Town" in the Lancaster Holiday Parade. The Optional Girls Team Competition Season started this past weekend (12/10-12/11) at the annual R5: The Cup Competition located in Cincinnati, Ohio. 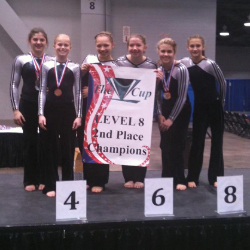 Our level 8 team started the season with a bang! The Team placed 2nd in the Competition! Individually, Hocking Valley tallied more first place winners than ever before at both their first meet of the season and at The Cup competition itself. Leading the way was Erin Beatty, winning the All-Around at her first ever Level 8 meet. She also claimed first place finishes on the Vault and Bars, and received second on the Beam. Hunter Wilson-Izyk received first place on the Bars and second place All-Around. Kayla Miller placed first on Beam, second on Floor and third on Vault. Ali Foltz finished second on the vault and fifth in the All-Around. Audrey Bennett placed fifth on the beam and fourth in the All-Around. McKenzie Ortiz placed fourth on the Beam and seventh in the All-Around.